Temporary crowns are made of plastic and as such, they flex when they are put under force while chewing. This is not a good situation, as the temporary cement that holds them on to the tooth can fracture and the crown can then come off the tooth. This is especially true for teeth that are short or when teeth hit hard--such as when individuals have no back teeth and they hit the front teeth hard. As such, it is not uncommon for temporary crowns to be lost before the permanent crown returns from the laboratory and can be permanently cement. 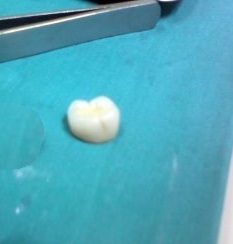 Should your crown come off, call our office and we will do our best to re-cement it for you in a timely fashion. However, should this happen outside of office hours, we do not consider a lost temporary to be a urgent dental emergency. While some sensitivity to hot and cold can be experienced when a temporary crown is lost, few if any lasting consequences arise if a tooth is left without a crown for a few days. While we do not like to leave the prepared tooth exposed for weeks--mainly because we fear tooth movement--allowing a temporary crown off a few days will rarely pose a problem. Often, however, a lost temporary crown can pose a "cosmetic emergency". This is especially true when the tooth in question is a front tooth. 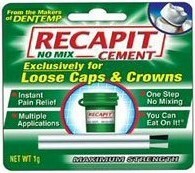 Should your temporary crown still be in tact, you can easily re-cement it back on the tooth yourself. 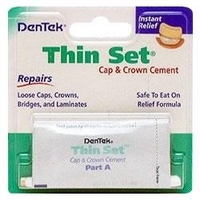 Several over-the-counter temporary crown cements are available for home use. Some of the brands are shown to the right. To re-cement a temporary crown, clean the tooth itself of any remaining temporary cement and then the inside of the crown as well with a toothpick. Using cotton, rolled paper towels or gauze, dry the tooth while having someone mix the cement (if required by the type you get). Place the cement into the crown so that all inner walls of the crown are coated and about 1/2 the crown is filled with the material. Place it back onto the dry tooth and keep pressure on it for at least five minutes. You may then use a tooth pick and floss to remove the excess cement. Be sure when you floss, not to pull the floss back out through the contact, but release one end of the string and pull it out to the side. We can then re-cement the crown for you during normal office hours should you not feel confident you obtained a good re-cementation. We regret that we cannot see patients for lost temporary crowns, but doing so would be impractical and after hour emergency appointment are prohibitively expensive. Lost temporary crowns are a headache for every dentist and many patients and until better temporary materials are developed, they will continue to be problematic. Your patience in dealing with this temporary condition while your crown is being made, is appreciated. Your permanent crown, being non-flexible and strong--along with the stronger permanent cement used under it--provides a much stronger type of cementation. Most permanent crowns, combined with permanent cement, cannot be removed and must be cut off should they ever need be removed. The experience with your temporary crown should not give rise to fear that the permanent crown may continue to fall out once its cemented permanently.